High quality HD optical Monocular telescope. Easy to operate and very convenient. Brand new Anti Slip rubber coating. Its lens can easily clean with cloth. It has variable focus length, you can turn item or ocular lens according to your necessitate. Command your home entrainment system with this universal remote control. Single hand operation, lightweight and portable. It’s suitable for enjoying beauty of nature, viewing birds and beast performance, watching sports, matches, Horse racing, mountain climbing, sightseeing, touring, exploration, shooting, fishing, Golf, scope, vocal concert etc. Admire the scenery and nature. It will help you to see the things in very low light. Fully coated optics, guarantee higher light transmission and brightness, help out you to see target clearly, whether you're searching for birds or trying to get a better view of the step. It has dual focus capability front back adjustable zoom. Extremely powerful, ultra compact and lightweight. 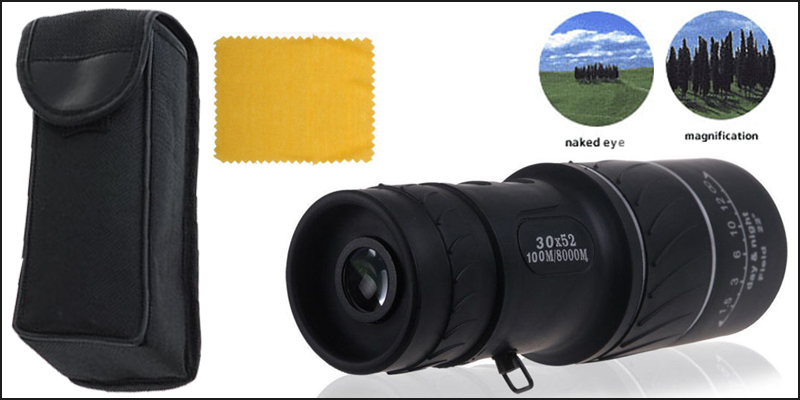 You will absolutely fall in love with this optical monocular telescope. It also has wrist strap, don’t worry about dropping it.